I have tried twice now. Cuttings from citrus, lemon, lime, mandarin. I have watched videos and read the various ways. I'm using basic potting soil. cut the skin around the end , dip in root powder. with more soil. Then zip lock bag over it with rubber band. Indoor room temp is 78-85deg. F.
What I notice after a week, 2 leaves drop, then the stem tips turn brown. bag and spray bottle to mist. still green. Does no leaves mean it will not work? why keep two leaves? it is placed near the sliding door so get light but not direct sunlight. Re: Why do my citrus cuttings keep dying? The soil should not be wet, only damp. Also, potting soil is not great for rooting cuttings. I've used it but usually for plants that root easily like mints and sedums. Better choice is seed starting mix with vermiculite or perlite or sand mixed in. But still it should not be wet, only damp. If you have a lot of condensation inside the bag, the soil is too wet. Don't allow the pot to sit in water, this makes it too moist and your cuttings will rot. A lot of water works only for willows and even those can rot before rooting. 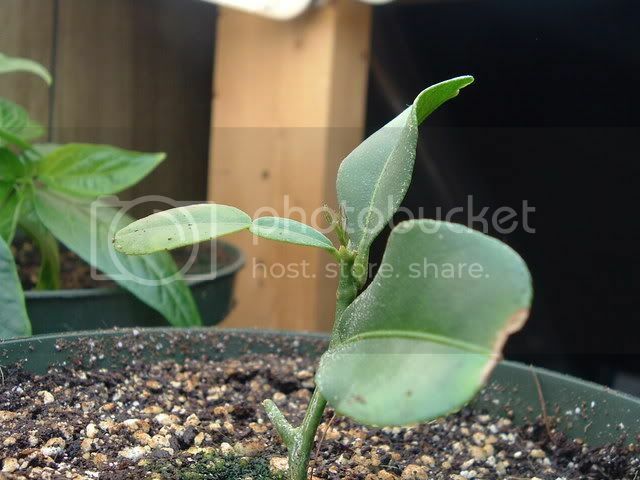 I'm no expert at rooting citrus, but I have rooted two unusual species (kaffir limes and curry trees), and I learned early on that trying to root very "new" growth cuttings was not successful. When I waited until the stem firmed up for about a week to ten days, but not enough to actually become woody, the cuttings stayed firm, and the leaves stayed on, while newer growth would become limp and die quickly. Herbs I look for the new growth, and most root within a week, but these take a month or longer, and even then, that is just the very beginning. I have also air layered these, which was successful, but it took about four months, though that was for enough roots to start a new plant with. And here's one that made it, showing how much older the ones were that rooted. By now, it has gotten woody, and is just beginning to get new growth, about 2 months after rooting it. And, as with all cuttings, I removed most of the leaves, since too many leaves will be too much for the stem to support. 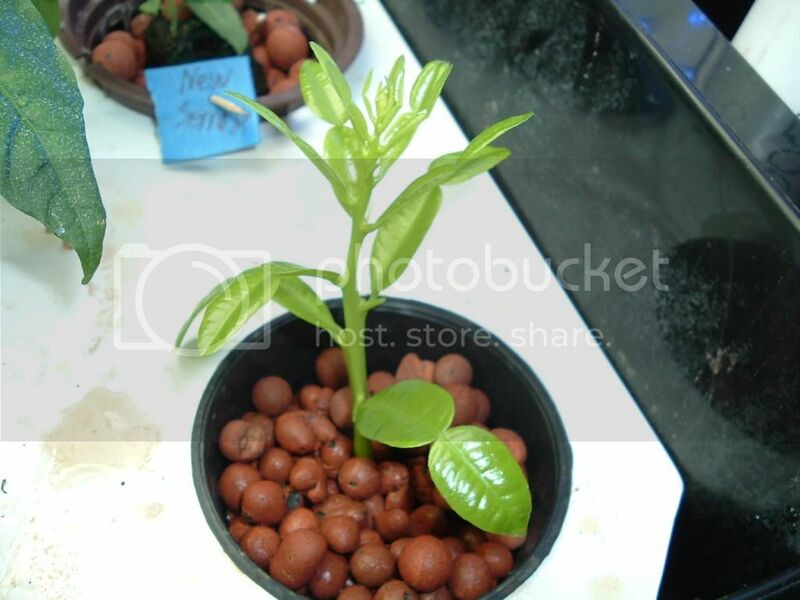 As pepperhead says cuttings should be taken when the plant is in active growth. You want green wood that is firm not soft. I have the best luck taking cuttings where the branch forks. Instead of rooting powder if you can get dip n' grow instead it is supposed to be better for woody cuttings. Try to get a fat cutting, the thinner ones don't have enough stored food to live on. Water the media and let it drain for about 20 minutes before you bag it. Open the bag and air it out if you have heavy condensation. i usually shake the bag out. Condensation should be light.